"Artichokes unlike others. The smaller the artichoke, the more tender the heart will be." Trim artichoke stems flat so the artichokes can stand upright and rinse artichokes thoroughly in running water. Hold artichokes upside down over a work surface and smash the artichokes lightly to open the leaves. Spread 1/4 of the garlic into the spaces between leaves of each artichoke. 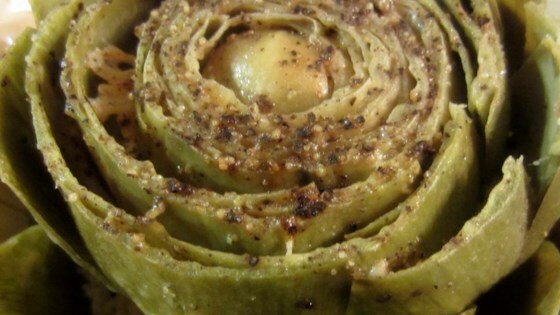 Season artichokes with salt, black pepper, and 1 tablespoon grated Romano cheese per artichoke, opening the leaves and letting the seasonings and cheese into the leaves. Push torn leaves of parsley into the spaces between the leaves to hold the seasonings in. Set the artichokes upright in a saucepan and pour peanut oil over the artichokes, letting the oil seep into the crevices between leaves. Gently pour water into the saucepan, taking care not to let the water splash on the artichokes and wash off the oil. Cover pan. Bring to a boil, reduce heat to low, and simmer gently until the outer leaves of the artichoke are easy to strip off but are not mushy or falling apart, about 1 hour. Test for salt and season with more if desired; simmer 5 to 10 more minutes to let the salt dissolve. See a simple technique for preparing and roasting artichokes. This looks like it is heavy on the salt and in reality, it might not be enough.